Long Term RV Space Close to Shopping & Parks in Post Falls! RV space in the Maranatha Mobile Home Park in Post Falls. Just off Seltice Way with easy access to shopping and parks. Space is 50′ long x 21′ wide. Rent includes water, sewer, and garbage. A cozy sunroom is great for reading the morning paper or enjoying the natural beauty of the area as you watch the sun rise. There are two main level bedrooms and the master bath has rich natural wood detailing with a tub/shower combo. An office, a laundry/mud room with washer/dryer hook-ups, built-in cabinets, bookshelves, and closets throughout the home provide lots of usable space and storage. The kitchen and dining room have warm hardwood floors and beautiful detailing. A large bay window in the dining room gives the space an open and airy feeling with plenty of natural light. Upstairs are two bedrooms with skylights, vaulted ceilings and a bathroom in-between. A/C and forced air natural gas furnace provide comfort for all seasons. Outdoors are just as wonderful as indoors, with mature landscaping, an automatic sprinkler system, and big shade trees. A covered back porch and separate seating area make this the perfect setting for hosting special occasions with family and friends. Additional bonuses are a single car garage and a carport to protect your vehicles from the elements, a gravel parking area for a boat or RV, and the security system to give you peace of mind. Move-in ready! Short term lease through September 15, 2017. Dogs considered on a case by case basis and upon owner approval. No cats. Enjoy life on the east side of Coeur d’Alene in this charming four bedroom two bath home that features hardwood floors and sunny rooms on a ¼ acre fully fenced lot. A great location on 15th Street just a short distance to Sanders Beach, the library, McEuen Park, Tubb’s Hill trail system, shopping, and restaurants. Looking for a smaller place with low maintenance but has plenty of room for storage? This 30’x36′ shop with a recently remodeled one bedroom apartment is the perfect place to call home! The shop area is large enough to store an RV, boat, or any of your toys while keeping them safe and protected. The recently remodeled one bedroom apartment inside the shop offers a unique way to enjoy a simple low maintenance lifestyle. The apartment features epoxy coated concrete floors on the main level, a complete kitchen with a refrigerator and range/oven, a full bathroom with a shower and washer/dryer hook-ups, new paint throughout, and new carpet in the living area and upstairs bedroom. Move-in ready! Welcome home! There will be no long drives to the lake when you live in this stunning 4 bedroom 3 bath home located in Hauser Lake. Only 1 mile to the boat launch – you can have the best of both worlds when you delight in water sports through the summer months while enjoying the breath-taking beauty of the snow covered pines in the winter. Arranged on a half-acre of beautifully landscaped property, this larger home provides the space you need without sacrificing the country charm. Featuring beautiful hardwood floors, vaulted ceilings, a large master suite with a good sized walk-in closet and en-suite bathroom, two guest bedrooms, a fourth room that can be used as an additional bedroom or office space, and two additional full bathrooms in a two story floor plan. The forced air natural gas furnace and A/C unit provide comfort for all seasons. With a large picture window and a vaulted ceiling, the living room is a comfortable and bright space to greet guests and admire the front yard. The fully-appointed kitchen features granite counters, tiled backsplash, plentiful cabinets, an island, and stainless steel appliances including a natural gas range/oven. A smaller breakfast nook to the back of the kitchen allows for more intimate meals while the formal dining area provides the room needed to host a larger dinner party. Enjoy the ambiance of the family room as you select your favorite book from the built-in bookcase and snuggle in while the flames dance inside the brick fireplace. A sliding glass door leads to the deck that is the perfect setting for hosting social events with family and friends or just relaxing on those warm summer nights. The fenced backyard with full sprinkler system and storage shed is large enough to park an RV. A short trail behind the home leads up a small hill to a seating area where you can behold all the nature’s beauty this property has to offer. Keep your four wheeled investments safe in the finished over-sized three car garage. Plenty of space for storage cabinets and counters to help keep things organized while working on projects. With all of the amenities, the spacious fenced-in yard, and scenic views in all directions, this home is made to be enjoyed and shared! A spacious floor plan and nice built-ins make this double wide mobile the perfect place to call home! 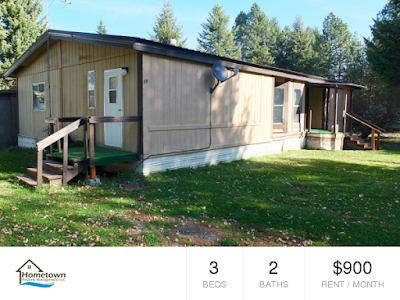 Located on a corner lot in the Walrose Mobile Park in Hayden just off of Government Way. Stay protected from the elements by a covered entry that opens into the living room with a large window and a vaulted ceiling . The nice size master bedroom and en-suite bathroom with a walk in shower are on one end of the home and the guest rooms and second bath with a tub/shower combo are located at the other end. The large kitchen includes a refrigerator, range/oven, dishwasher, ample cabinets, a built-in desk and breakfast bar. The dining area surrounded by bay windows gives the space an open and airy feeling with plenty of natural light. A second entrance leads into the laundry area with washer and dryer hook ups. The corner lot allows for plenty of off street parking and the mature trees will offer plenty of shade from summer heat. Rent includes park space rent, water, sewer and garbage. Move-in ready!